(Nanowerk News) Physicists are continuously advancing the control they can exert over matter. A German-Spanish team working with researchers from the Max Planck Institute for Nuclear Physics in Heidelberg has now become the first to image the motion of the two electrons in a helium atom and even to control this electronic partner dance ("Reconstruction and control of a time-dependent two-electron wave packet"). The scientists are succeeding in this task with the aid of different laser pulses which they timed very accurately with respect to each other. They employed a combination of visible flashes of light and extreme-ultraviolet pulses which lasted only a few hundred attoseconds. One attosecond corresponds to a billionth of a billionth of a second. Physicists aim to specifically influence the motion of electron pairs because they want to revolutionise chemistry: If lasers can steer the paired bonding electrons in molecules, they could possibly produce substances which cannot be produced using conventional chemical means. Electrons are hard to get a hold of. Physicists cannot determine their precise location in an atom, but they can narrow down the region where the charge carriers are most probably located. When electrons move, this brings about a change to the regions where the electrons have the highest probability of being located. In some electronic states – physicists call them superposition states – this motion manifests itself as a pulsing with a regular beat. On the one hand, the study of an electron pair is useful for physicists who want to gain a better understanding of how atoms and molecules interact with light as this interaction usually involves two or more electrons. It is useful for chemistry, on the other hand, if they are able to direct pairs of electrons, because the typical chemical bond consists of just such a pair; this means that chemists must always move at least two electrons when they want to create or break a molecular bond. In order to choreograph and film electrons in a helium atom, the Heidelberg-based physicists sent two laser pulses through a cell with helium gas. It is not only the energy, i.e. the colour of the pulses, which is important here, but also their intensity and the interval between them. The researchers first move the electrons of the helium into the ultrafast pulsing state with the aid of an ultraviolet flash. They succeed only because the duration of this pulse is shorter than one femtosecond (one-millionth part of a billionth of a second), however. This is how long the pair of electrons needs for one cycle of the pulsing motion in which the pair is initially closer to the nucleus, then moves away from it and then returns to the nucleus again. 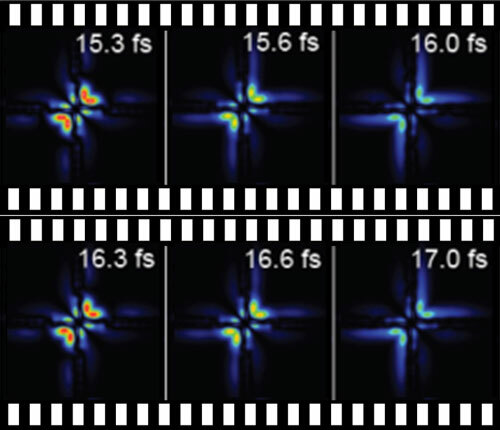 The researchers then use a weak, visible laser pulse to determine where the electrons are dancing at that particular moment. And by varying the interval between the ultraviolet attosecond pulse and the visible one, they produce a movie of the electronic dance: “Although we do not directly image where the electrons are,” explains Thomas Pfeifer, “the visible pulse provides us with the relative phase of the superposition state.” The phase describes the to and fro of an oscillation, and hence the rhythmic motion of the electron pair. In this case it tells the physicists at which point of their natural pas de deux around the helium atom the electrons are at a given moment. The team in Heidelberg uses findings from previous research to determine the dance moves. From this existing knowledge they determine where the electrons are when they are not moving. “With the information on the phase which we measured here and our prior knowledge we reconstruct where the electrons are at a given time,” says Pfeifer. He and his colleagues' experimental results are in good agreement with state-of-the art theoretical simulations by their cooperators Luca Argenti and Fernando Martín at Universidad Autónoma de Madrid in Spain, confirming the validity of the experimental and computational methodology. The Heidelberg-based physicists also rely on these simulations to confirm the second part of their experiments. The visible laser pulse here serves them not only as a camera but also as a pacemaker for the pulsing motion of the electrons. For when they increase the intensity of the pulse, the points in time at which the electrons are close to the atomic nucleus or further away from it shift in time. The researchers also record in an image sequence how the rhythm and thus the choreography of the electronic dance changes. Thomas Pfeifer and his colleagues have not yet been able to explain all the details which they observe in the experiments with intense laser pulses. They want to change this now with more comprehensive experiments on the effect of the pulses. In future experiments they also want to follow the subsequent fate of the pair of electrons in great detail, for the electronic dance in the superposition state ends with one of the two partners being ejected from the atom, with the consequence that the atom is ionised. These ionisations also play a role in many chemical reactions. A better understanding of such wild two-electron dances could thus tell chemists how a reaction can be steered into the desired direction and product channels. At this point, at the latest, attosecond physics would create new tools for chemistry as well.